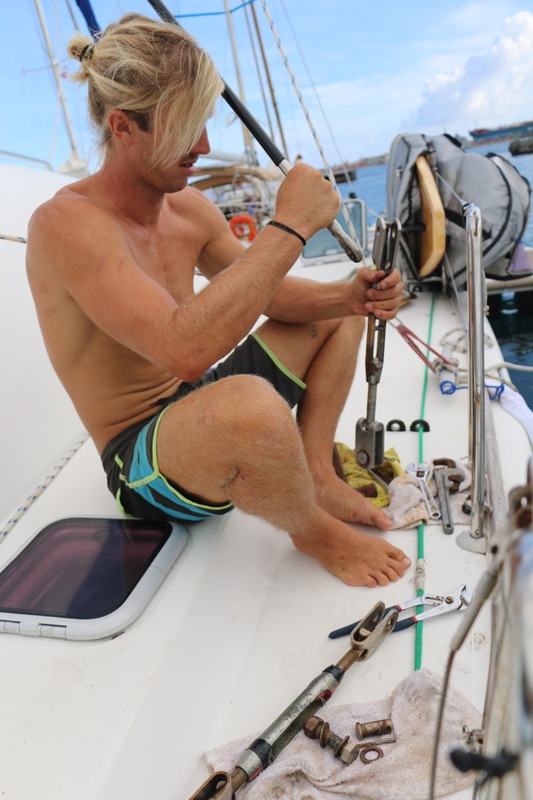 We had some extra motivation to get our boat chores completed quickly this morning. (I’d like to say I even ran faster during my a.m. park jog, but that would be an abrupt lie that these boat legs could not pull off.) 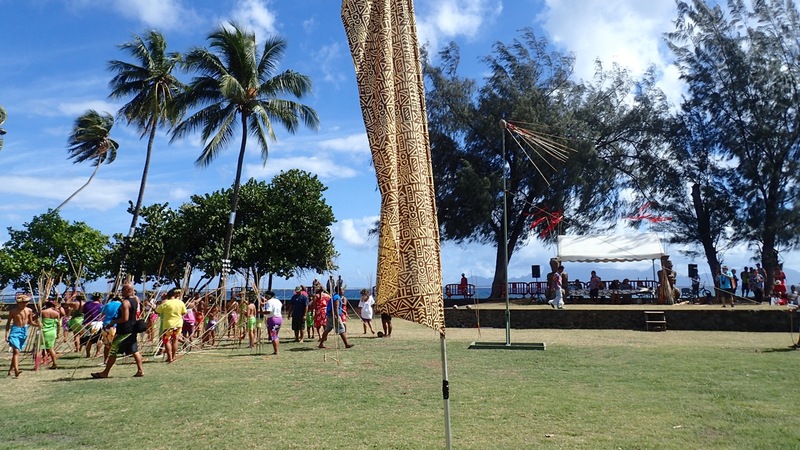 So with the replacement of each of our side shroud fittings complete we rounded up the troops and headed out to the Polynesian Games! After a sardine-packed taxi ride to the north end of the island we – Adam and Josh, Annie and Tab – wandered in to veritable jamboree of sport and spectacle. The bustling green park was filled to capacity with competitors, performers, and onlookers, all hemmed in by the shaded sea wall holding the crashing surf at bay. The whole event had the excited feel of an elementary school track meet. You know the one where your next trip to the canteen for your third Mr Freeze of the day is just as important as your showing in the 50 meter sack race. Don’t let that make it sound like there wasn’t some serious sport going on there, I’m just trying to convey the jovial nature of it all. Because the sport, the sport was a marvel to say the least. As we first ambled into the park we walked along a field of landed javelin, with a shower of spears continuing to fall within them. At first glance the challenge seemed, well, a little unchallenging. With 50+ competitors toeing the line, they hucked javelin after javelin at will, to near and about the same location. The champion seemed to be a very grey affair. Though upon further inspection the aim of the game and expertise involved became remarkably clear. About 30 meters off the line stood a tall stalk of bamboo, and at the top of this pole, swaying 30 feet in the air, was a coconut. A coconut stuck full of javelin! These men were lobbing their javelin, underhand, with incredible precision to hit a coconut suspending a couple of stories in the air. 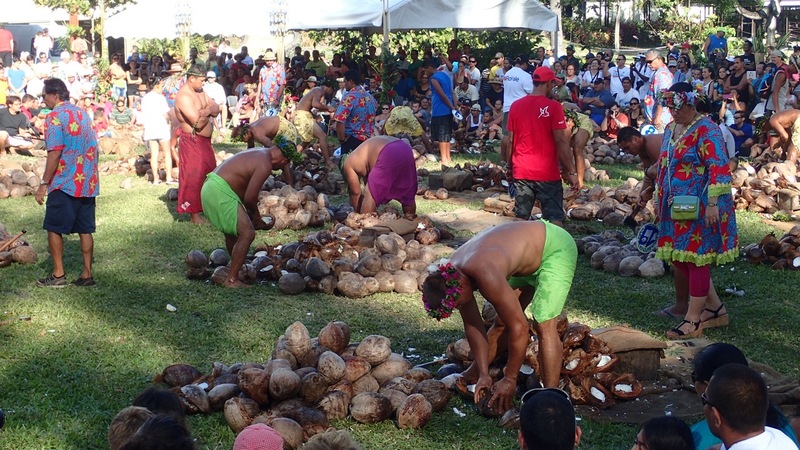 When the horn blew, ending the given time for that particular match, the coconut was lowered and the javelins and points were collected. For we saw the coconut at closer range and realized that not only were they aiming to hit this small target, they were attempting to land their mark on the higher scored portion of that near-impossible goal. Next we took a seat to watch a lovely show of Polynesian song and dance. 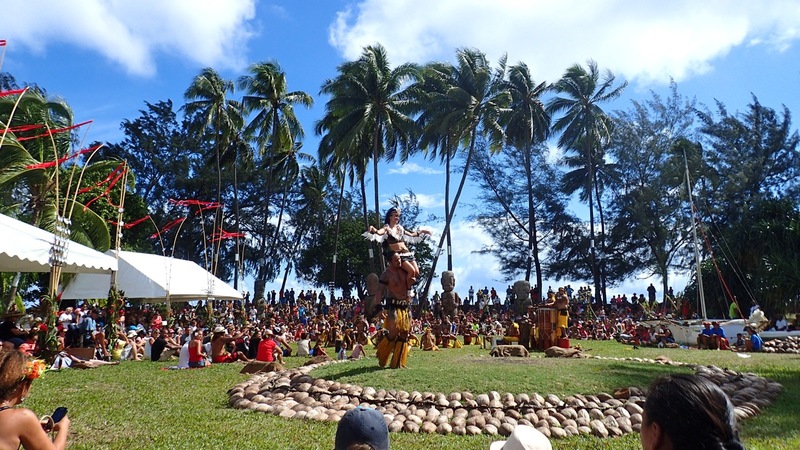 With a beefy seven man drum section, the men and women dancers displayed their stuff. The never-ending shake of the ladies hips had me mesmerized and thoroughly impressed. I’m pretty confident that no number of feathers, palm fronds, flowers, or beads could even begin to give my hips the allusion of moving like that. And what the men lacked in hip-shaking they more than made up for in thrusting and smacking. Watching these men chant and stomp, slap and roar their way around the stage left me sure that in the dictionary beside Manliest Dancers in the World would be a picture of Polynesians. With the dancing complete the program moved on to stone lifting. An event for the strong-willed and strong-backed! 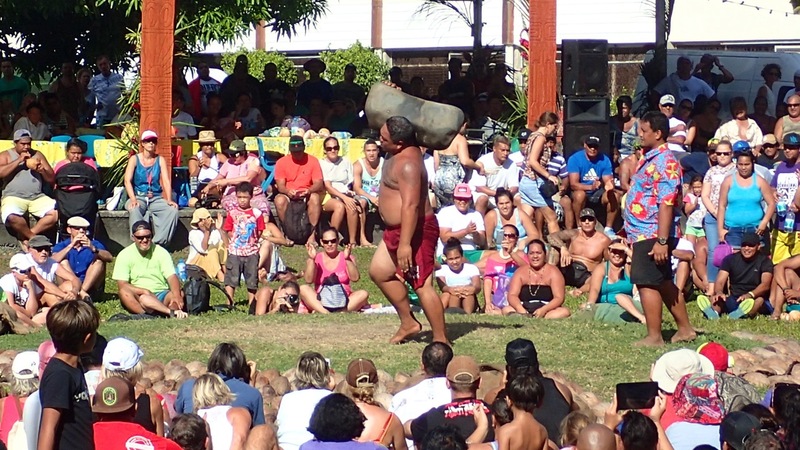 We watched as competitor after competitor entered the ring and attempted to raise this huge stone from the ground to their shoulder. Each lift was timed in order to place the successful lifts against one another. Throughout the competition the incredibly awkward to grasp stones got bigger, and the cheers and groans from the audience grew in intensity. 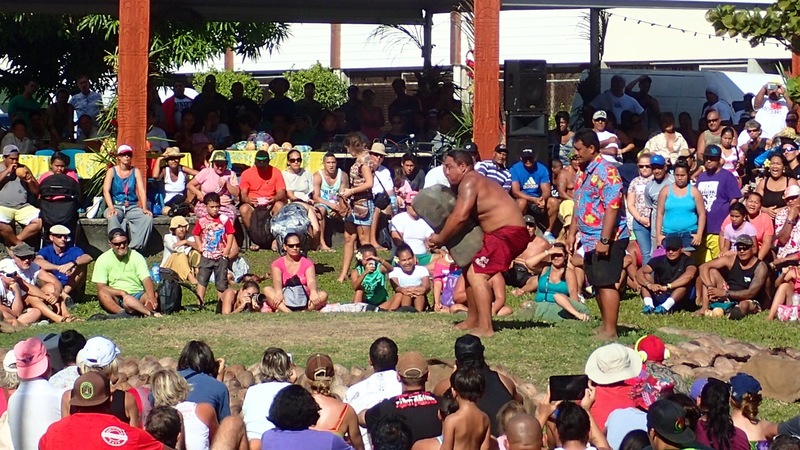 The final stone that was brought into the ring was 160kg. That’s over 350 lbs! A weight I’m sure I couldn’t lift with the assistance of three friends, let alone roll it over to position it in preparation. 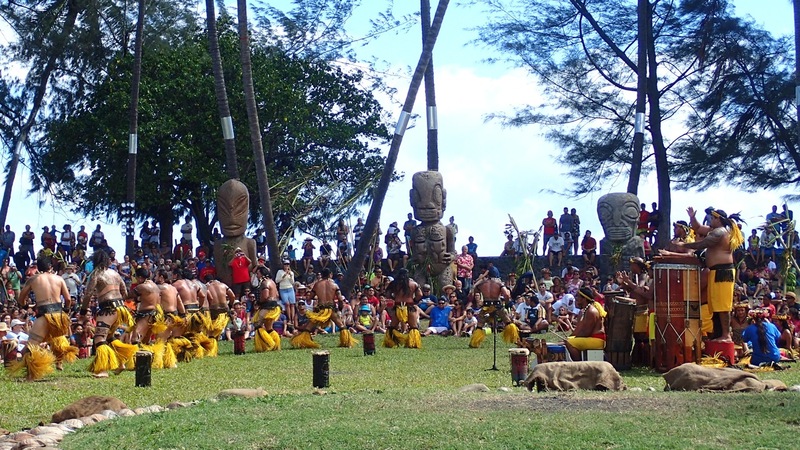 Then, as if the macho-ness and capabilities of these fine Polynesians was yet in question, the next event really brought it home. 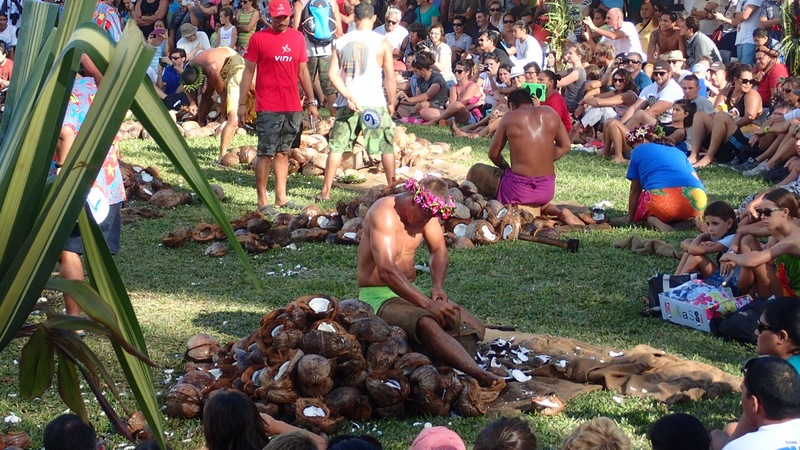 Twenty-two piles of 100 coconuts were assembled on the grass stage with a single competitor assigned to each. With all the judges, axes, burlap bags, and shucking spoons in place the copra race began! 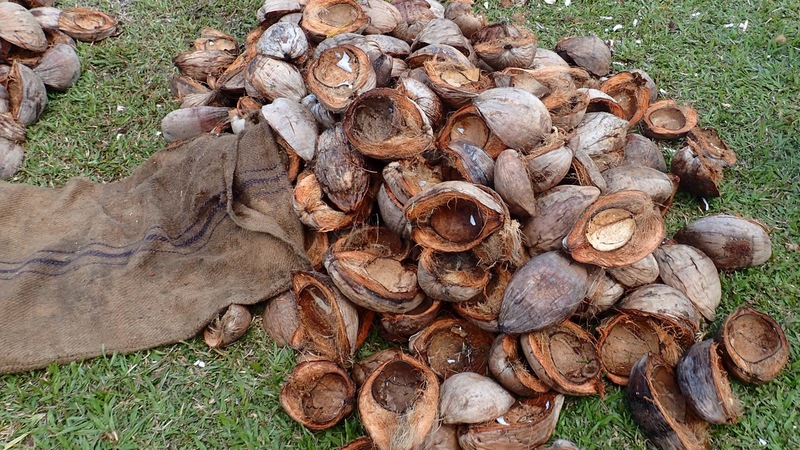 Copra is dried coconut which is shipped to a processing facility to made into oil. 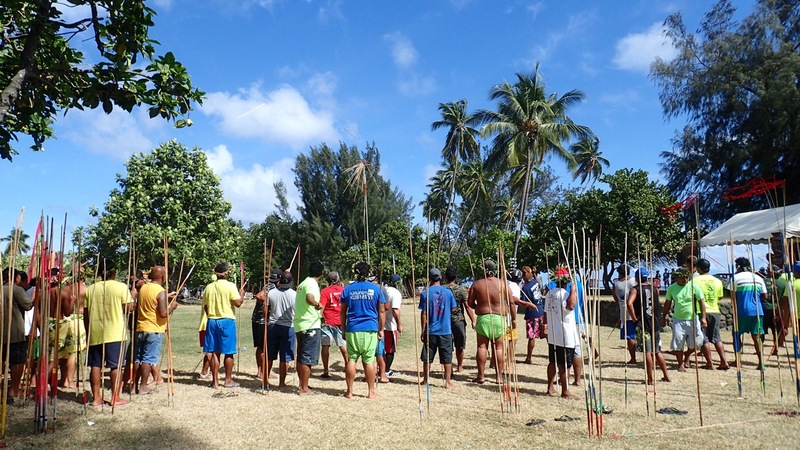 All throughout the Marquesas and Tuamotus we saw many copra farming locations. It is a very important part of Polynesian economy and with their copious amounts of coconut palms its easy to deduce why. As the gunshot signalled the start of the race the speed and skill of these men set to work. 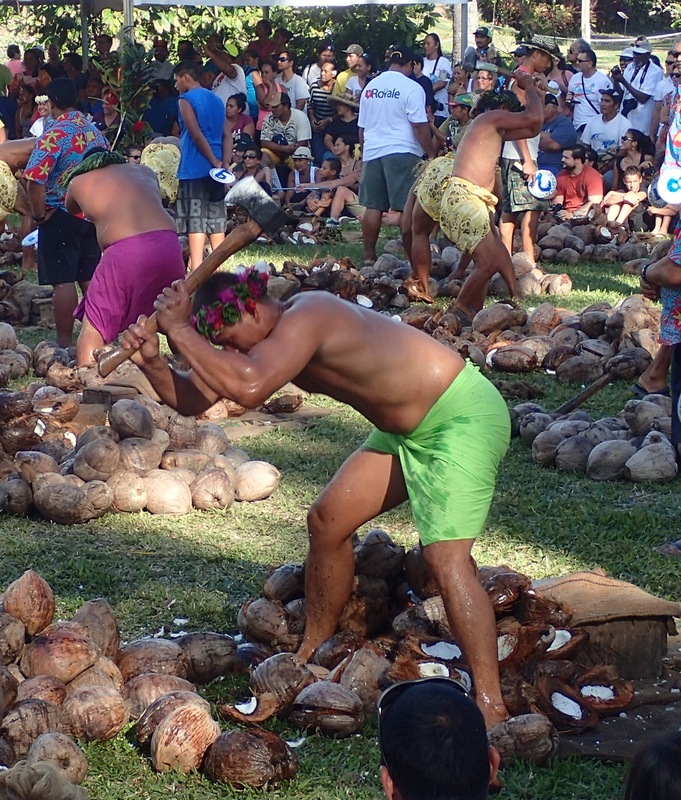 First off the competitors flew at their pile of coconuts with their axe. As they halved each coconut they sent sweet coconut water and chunks of nut flying everywhere. With the first phase of the race complete, they then sat down to shuck the meat out of each and every section of the split nut. It was easy to see that a practised technique was critical here for the clean and prompt removal of the vital white meat. 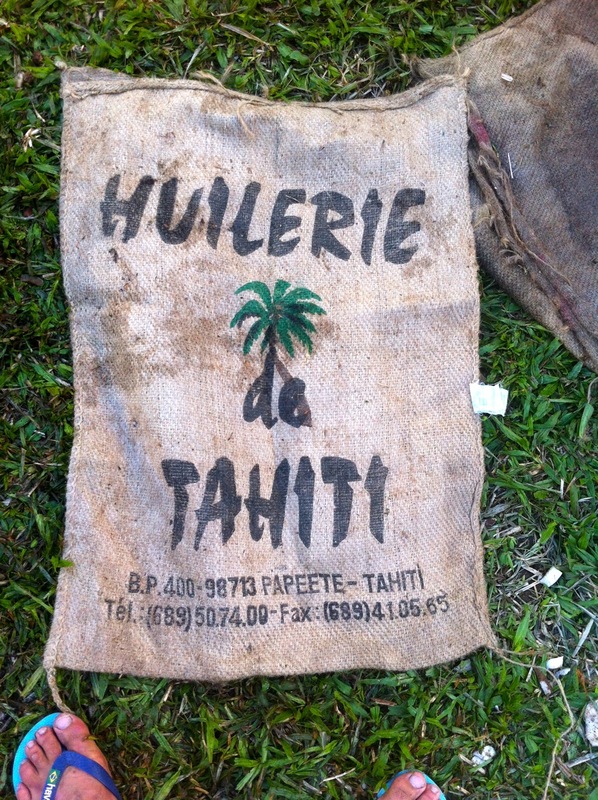 Finally after they had axed up 100 coconuts and scooped the meat out of the now 200 pieces, they collected the desired product in a burlap bag to signal the end of their race. We were stoked to witness the man positioned right in front of us, who we had been cheering on profusely, place third overall in the competition. The final event we watched was a traditional dance by the Maori people of New Zealand. The Haka is a traditional ancestral war cry and is pretty terrifying. I had no trouble imagining their enemies retreating far, far away from a battle with these people. A big boat on a little truck. 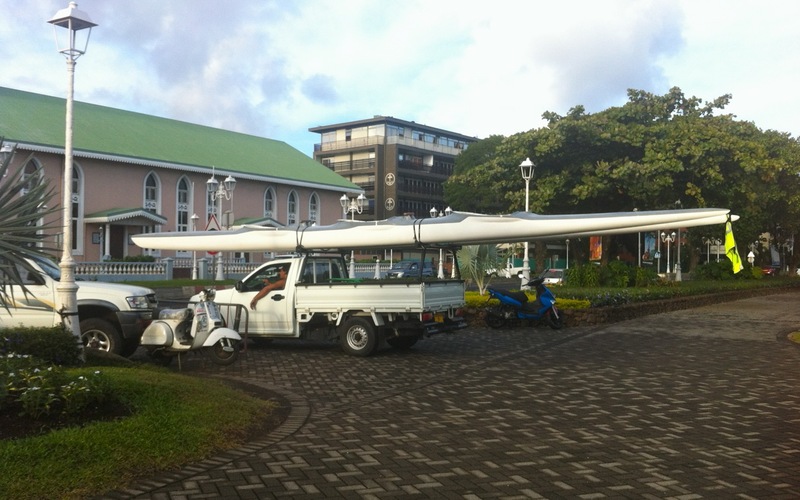 Va’a’s are the traditional outrigger canoes of the Polynesian people. 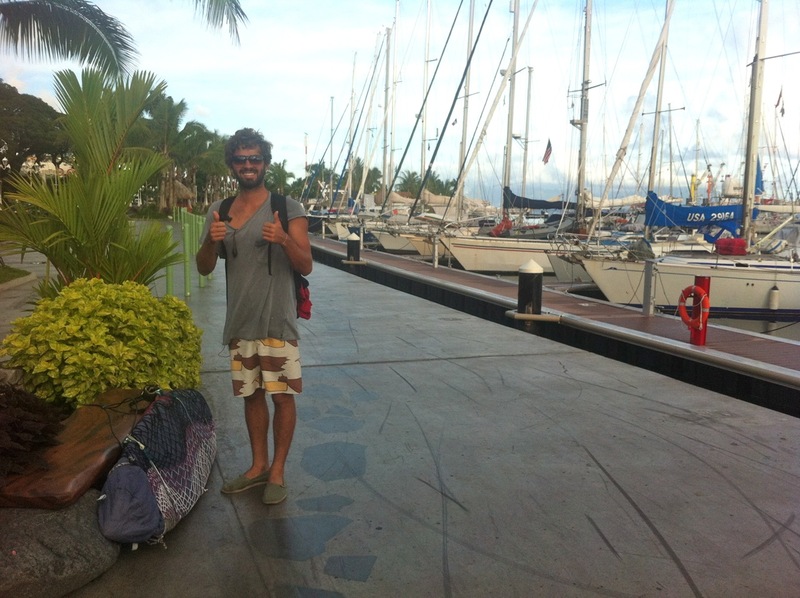 We’ve seen them all through French Polynesia and the city of Papeete is no exception. Kim left us today to continue his adventure. Thanks a million for the good times Kim, and I hope you get all the waves your heart desires! Gregory installing the new fittings on the side shrouds. 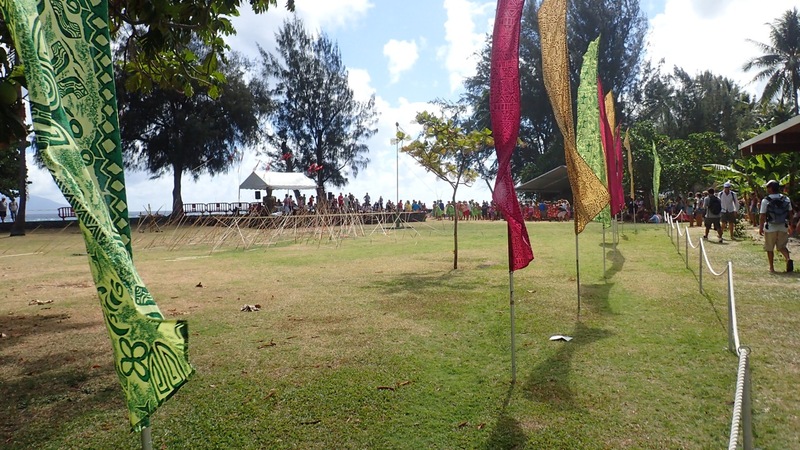 Entering the Polynesian Games! 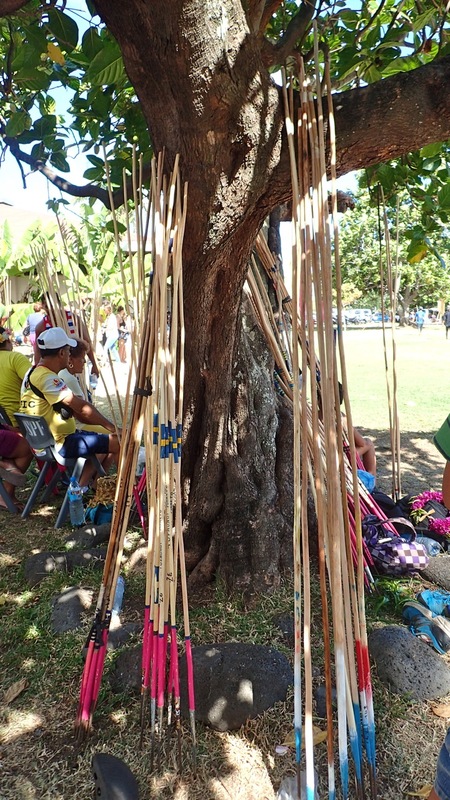 Check out the field of javelins. This round of javelin throwing is over as everyone collects their spears from the grass. Check out the pole with the coconut on top though! Many javelins hit the mark! Watching some traditional Polynesian dance. The javelin competition was on ongoing event. This is the back of the line as spear after spear is being lobbed to its target. Let the copra race begin! This is the guy we were cheering for. Right now he’s separating the coconuts he’s already axed in half, from the ones that still require opening. The pile of cleaned out husks that are left over. Gregory was/is obsessed with these copra bags. One will be his… eventually. What an awesome experience, thanks for sharing Kaycee 😊 And great job on the repairs Greg, it’s a good thing you are able to tackle any project!